in 1985 and has been in practice since 1986. Dr. Hatfield is licensed by the Texas Board of Chiropractic Examiners. He is a member of the Texas Chiropractic Association. Dr. Hatfield attends post graduate seminars and receives training each year. Hatfield Chiropractic was established in 1986 in Beeville, Texas. It is a multi-therapy holistic health center offering the highest quality service in a relaxed, comfortable environment. Dr. Hatfield opened the clinic to offer the community a holistic health alternative. Hatfield Chiropractic, in addition to offering traditional chiropractic therapy, offers physical therapy, activator method, spinal decompression, as well as exercise therapy, rehabilitation, nutritional counseling, and health maintenance programs. 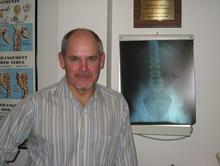 Dr. Hatfield is assisted by a dedicated staff certified in chiropractic paraprofessional procedure. We cordially invite you to call the office for an appointment for a complimentary consultation with no obligation. Give us a call at (361) 358-2578.